Manu and Zalak here today and we bring you another fresh challenge for the month of November 2017 for you all. Can't believe it's almost the end of another fabulous year! 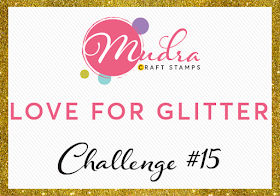 This month we are all going glam with lots and lots of glitter in our projects!! 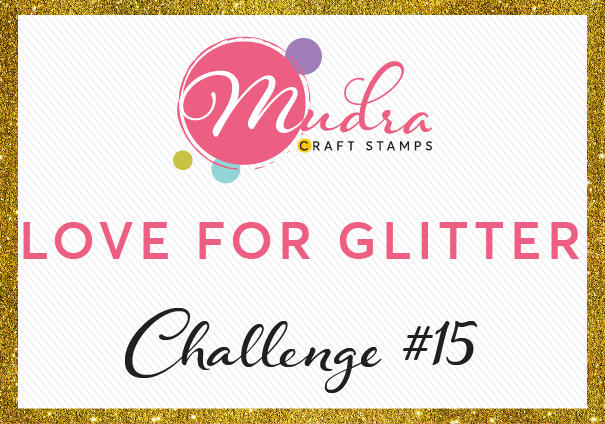 Glitter is a crafter's best friend and lets make everything sparkle and shine! You can use glitter in any form as long as it shine bright in your projects. 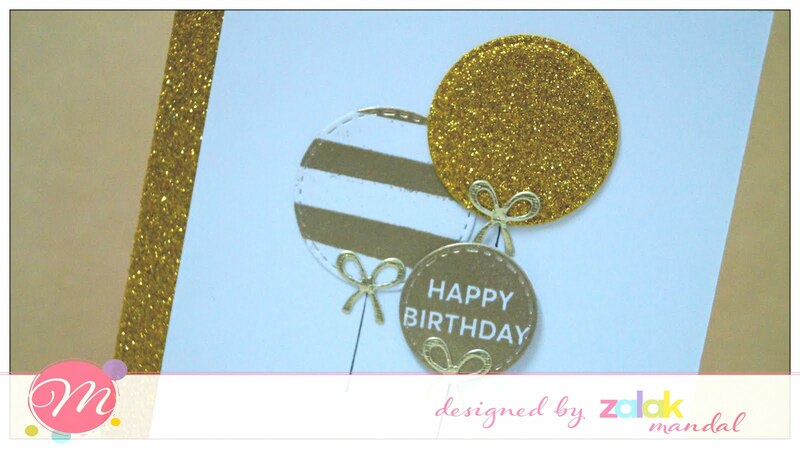 For creating the above card, I have take two different CS and another is gold embossing powder. 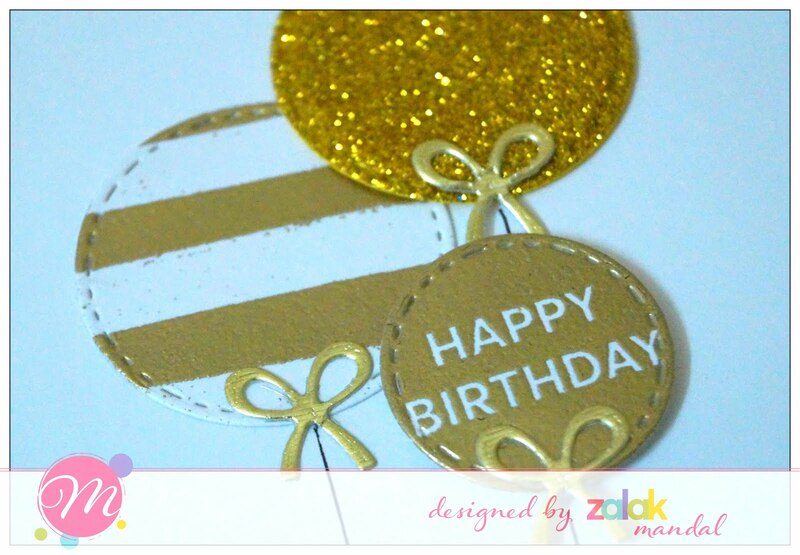 One Glitter foam sheet, Gold CS and Embossing Powder. 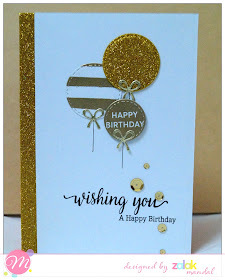 First I stamped "Happy Birthday" using gold embossing powder, I then mask some strips, stick white CS and heat embossed with gold powder and then die cut three circles, one from Glitter sheet and two from bielo white CS (which is heat embossed). Then I die cut some bow from Gold CS and adhered to all three circle to make a balloon look. Cut one half inch strip from glitter sheet and adhered on card base. To finish this card, I have stamped sentiment from "wishing you" stamp set and adhered all balloons on bielo white CS and some gold couture sequins. Super gorgeous, Isn't it?? It's super sparkly and bright and shiny!! Here's my take on this challenge. I took a different route with the color combination, lets see. 1. Take a A2 size cardstock and stamp with the versafine ink using the leafy stamp from the leafy stamp set. 2. Use Zing blue glitter embossing powder and heat set the background. Distress the panel using the raspberry distress ink and the peackock feathers ink. 3. Stamp flowers from the Wild rose stamp set and watercolor using the zig clear markers. Fussy cut and adhere as per the composition. 4. Mount this panel onto an A2 size card. Your card is ready! Use of Mudra products is must to qualify for the challenge.